Telemachus: Since When Did Offering Someone a Government Job Become a ‘Crime’? Since When Did Offering Someone a Government Job Become a ‘Crime’? Congressman Joe Sestak (PA) apparently has hoisted himself on his own petard by trying to find a campaign issue that would show he is ‘fighting against the machine’ in Washington. He asserted he was offered the Secretary of the Navy position if he dropped out of the Senate primary against now soon-to-be-former Senator Arlen Specter, whom Sestak defeated in the most recent primary. And the Obama White House is denying it all as is everyone else in Washington. Apparently, the story ‘worked’ for Sestak....at least for the primary season. President Teddy Roosevelt served with distinction as Secretary of the Navy before becoming McKinley’s Vice-President. Being Secretary of the Navy, or the Army or the Air force or any military service of our nation is a high honor indeed because of the people you get to lead. Only a very few people are qualified at any one time to be appointed to such an important public servant office. We salute Admiral Sestak’s service to our nation in the U.S. Navy as we do anyone who has been brave enough and qualified enough to put on any US uniform to protect our freedom to write, argue, debate and speak about things like whether this appointment was a ‘crime’ or not. Many-to-most of the later Boomer generation has never served in the military because we were the first 'Fortunate Generation' to not have mandatory conscription in the history of the Republic. All of this hubbub about whether Bill Clinton or Rahm Emanuel offered Sestak the job or a non-paying job on some board in Washington diverts attention from the most important point of this election in the first place: Do the people of Pennsylvania want Admiral Sestak in the US Senate so he can vote 'aye' or 'nay' for any more spending programs and do their work in Washington for them? We have some major concerns on this score, even though we can't vote for or against Congressman Sestak. Namely, were there any good accounting, economics, business administration 101, quantitative analysis or public administration classes being offered at the Naval Academy during his time there? He voted for $3.5 trillion in new debt since 2008 by voting 'Aye' for all these humongous spending programs without off-setting revenues or spending cuts to keep our national debt from exploding into orbit. By that line of reasoning, one might surmise that a fleet under former Admiral Joe Sestak routinely spent way over budget and never allocated scarce resources to optimal effect on the high seas. We couldn’t fight a war for very long if we didn’t prioritize objectives and concentrated efforts to where they could be most useful to produce a victory. That is the most troubling thing about this debate over whether he was or was not offered the Navy Secretary job: It diverts attention from his voting record while in office and it makes it even more difficult to find great, qualified people to serve in public office in the United States of America. As Navy Secretary, he probably would get paid one-sixth of what he could make in a similar capacity in the private sector. And he would be in-and-out of meetings with Congressional officials so often that a return to the battleship in harm's way might seem more attractive. So ‘where’s the bribe’ in asking someone to serve in the public sector at a comparatively lower salary when it is so danged hard to get great people to serve in the first place? Abraham Lincoln appointed 4 of his political opponents to his first Cabinet. They were qualified people, no doubt but he said he did it solely to ‘keep an eye on them’ and ostensibly to keep them all out of the 1864 GOP primary. We know tons of people who have been told that they would receive help in retiring their debt from a previous campaign if they would step aside in favor of another more favored candidate. Fort Leavenworth, Kansas does not have enough room for politicians who have helped other people find jobs in the federal government after running for office and losing in a primary or general election….is that now ‘illegal’? We would be horrified if we were to find that Congressman Sestak was offered a big bag of freshly minted cash in some parking deck next to the Watergate Hotel or perhaps a shipment of gold bullion to a Swiss bank account. 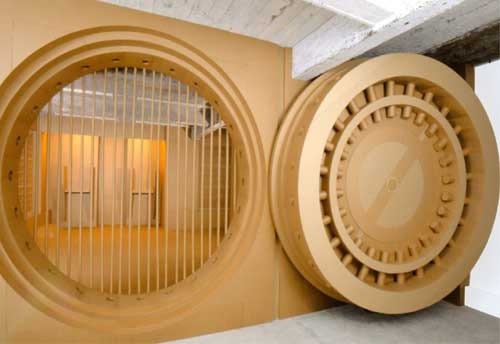 In fact, there is a big old safe in every single congressional office that is a throwback to the days when people actually walked in to a congressman’s office, plunked down cash in an envelope and asked for their vote on a bill. One day, the chair of the House Administration Committee opened up his desk drawer and saw hundreds of thousands of crisp greenbacks in there and immediately requisitioned a safe for each of the 435 offices. Now, that, ladies and gentlemen, is a flat-out-and-out bribe in the first degree. Trying to get great people to serve in responsible positions in the federal government seems to falls slightly below that test. We don't have enough great 'citizen-politicians' willing to serve their nation in government service now as it is. Do we want to chase the rest of them away as well by showing them 'how Washington really works' in this Sestak Caper?